Window Maker firmly adheres to the behavior and functionality of the NeXTSTEP™ user interface. The developers have put forth a great deal of effort in capturing the essence and beauty of the original design, and have incorporated some new ideas of their own. This has always followed the philosophy of keeping to those features which fit well into the overall design, while limiting the amount of “feature creep” that tends to bloat other window managers. A summary of the main Window Maker features are presented below. National language I18N support (over 11 locales). Built-in icon dithering with support for 4bpp and 8bpp displays. Popup menus that support keyboard traversal, which can be “pinned” to the root window. Support for GNUstep, GNOME, and KDE window hints to better integrate with those desktop environments. Support for Motif™ and OPEN LOOK™ window hints to better interface with applications based on those toolkits. Built-in GUI configuration utility that eliminates the need to hand edit config files. Application Dock (similar to NEXTSTEP/MacOS X Dock) that can be configured using drag and drop. Workspace Dock (aka Clip/Fiend) which is a workspace specific Dock extender. Support for rudimentary session management. Support for dockapps (equivalent of applets or epplets). Ability to change all preferences and menus on-the-fly without having to restart the window manager. Support for multiple workspaces (aka “virtual desktops”). Ability to maximize windows in half left/right/top/bottom of the screen and also quarters. Ability to display minimized window content as small preview (apercu). Up to 9 buttons mouses support. And more. You can go either through the git log and/or NEWS file. Over 13 types of window decorations, including custom defined. Support for XPM, PNG, JPEG, TIFF, GIF and PPM icons (no conversions with external programs) with an alpha-channel. Additional format, which ImageMagick supports, will be accessible if compiled with ImageMagick support. Support for setting the root window background (via the wmsetbg utility). Even differnt one per workspace. Optional superfluous animations, such as window shading, customizeable icon miniaturization effects, slide/scrolling menus, and much more. Despite all of these features, Window Maker is not resource intensive and remains stable across many UNIX varients. It is extremely flexible, and many options can be included or excluded at compile time. This means that you can easily tailor Window Maker to meet your needs; whether you are a minimalist wanting to save resources, or an extremist that likes to theme everything in sight. 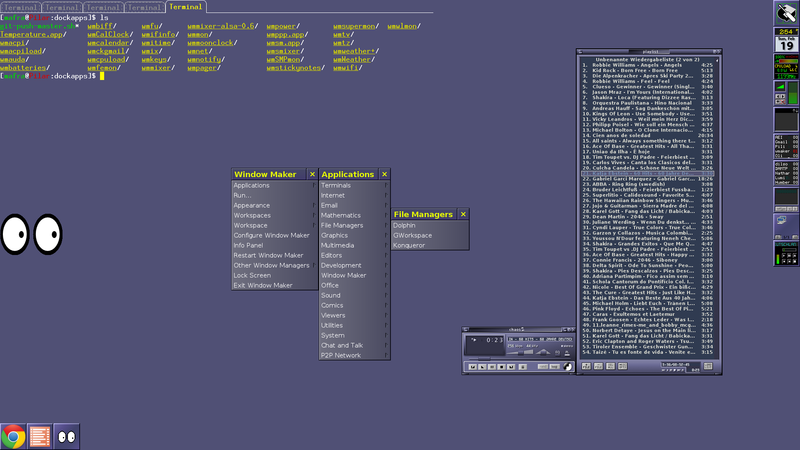 A screenshot of a typical Window Maker workspace is here.